Bean to Bar chocolate is one of our favourite things, and we’re delighted that people are interested in learning more about it. Bean to bar chocolate is special because the producers source cocoa beans from local and sustainable plantations in all corners of the globe, then make their products with a combination of love and science – the delicious end products are only part of the goodness which is bean to bar chocolate. The stories behind the producers and how they make their chocolate are amazing, and at Bean Bar You we’re excited to share their stories with you. 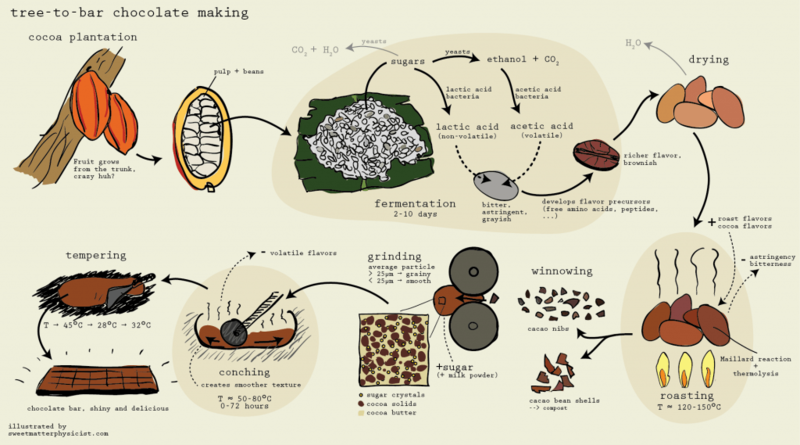 One of the best illustrations we’ve seen explaining how bean to bar chocolate is made is by Florian Hube (see below). His blog post about Tree-to-bar chocolate is wonderfully detailed, and a great place to go if you want to learn more about this fascinating process. But put simply, once the beans are picked, fermented and dried at the plantation, they are sent to the producer. The beans are roasted, ground and often divided into cocoa power and cocoa butter. These are recombined and mixed with sugar (and sometimes milk powder) to create what we know as chocolate. Sometimes makers add things like vanilla, nuts, cocoa nibs or coffee to create flavoured bars. In most bean to bar chocolates there are no added preservatives, emulsifiers or synthetic flavourings, this is a natural product. Illustration by Florian Huber of KändiLab. Even with 3 ingredients there are many variations of chocolate. 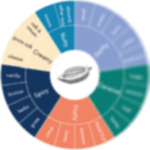 The beans are the foundation – the type of bean and where it is grown dictates the flavour profile. Cocoa beans can grow in regions between 10′ north or south of the equator.